Yes, I know it’s not the first time that I have waxed lyrical about Betty Jackson’s range for Debenhams department store, but I do like it. The clothes are nicely thought-out: simple and elegant, with a few special details. 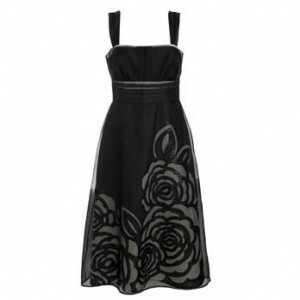 This black dress is on sale, reduced from £100 to £30, and it fulfils all of the above criteria. It’s 100 per cent silk, with an ivory under-layer. The flowers on the skirt are cut out of the silk and trimmed with black sequins. It’s supposed to be an party dress, but I think it would work well in the day too: teamed with black boots and hosiery, and a little white cardi. Available in-store and for delivery.